Home BSNL Broadband BSNL Broadband Offers-Discounts-Revision-Withdrawn Static IP Address Unlimited-Broadbandplans How to get Static IP address and 8 Mbps Speed for Unlimited BSNL Broadband plan? How to get Static IP address and 8 Mbps Speed for Unlimited BSNL Broadband plan? BSNL has announced the attractive scheme offering Static IP address with 8Mbps speed for Unlimited Broadband plans in all Telecom circles from 1st July, 2016 onwards. State run Telecom Company Bharat Sanchar Nigam Limited (BSNL) offering Static IP address with 8Mbps Unlimited Broadband plan ‘BBG Combo ULD 1441’ on PAN India basis under Broadband services. BSNL moving strategically by introducing various attractive plans under Broadband services, Landline Services as well Mobile (Prepaid plans and Postpaid plans) services in all Telecom Circles to attract customers. Recently BSNL has announced Extension offer of Free National Roaming to receive free incoming call any where in India from 15th June, 2016 onwards for a period of One Year under Mobile services. As per latest information, BSNL competent authority has decided to regularize the promotional offer Broadband Unlimited plan ‘BBG Combo ULD 1441’ in all Telecom circles with effect from 06th July, 2015 offering without Static IP address has been regularized. 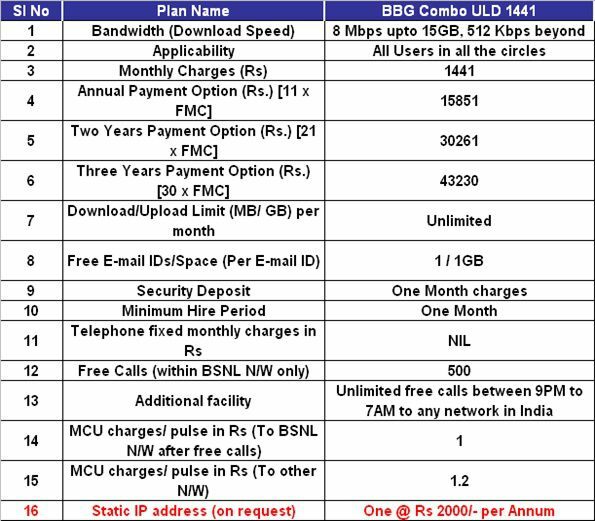 Now, based on several requests from field units and customers BSNL is offering Static IP (on request) address with ‘BBG Combo ULD 1441 Broadband Offer plan @ Rs.200/- per annum additional charges in all Telecom Circles. BSNL is already offering Static IP address to all Unlimited Broadband plans customers with FMC (fixed monthly charges) of Rs.1000/- and above. Customer those who require Static IP address may submit their request at their nearest BSNL customer service center respectively. The above offer will be implemented with effect from 1st July, 2016 onwards on PAN India basis under Broadband services.